I've been nominated for the Southern Sass Award! Thanks so much to Tara of Shoes I'll Never Have for nominating me! 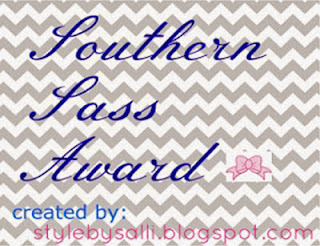 The Southern Sass Award is meant to reward smaller bloggers who represent "Southern sass." The rules: Answer the questions, and then nominate a few other bloggers. Here we go! 2. Who/what has inspired your style the most? 3. What are your top three favorite stores? 4. What are your top ten fall essentials? 5. What was your most recent purchase? 6. What is your favorite Lilly print and why? 7. How would you describe your style in three words? 8. What is your favorite monogramming store? Congrats on the award! How exciting! !